Is there some way to get the info on the SoftRock radio without joining the Yahoo newsgroup? I don't need another email address. I just want to skip to the chase and get the building instructions for the Lite I.F. board then download the software, which apparently can be anything for SDR. Is the SoftRock product a take off from the FlexRadio folks? Like an affordable version of the $2700 FlexRadio? Minus many whistles and bells?? With the proper software loaded can I demodulate the usual modes plus synchronous detector and DRM??? "Is there some way to get the info on the SoftRock radio without joining the Yahoo newsgroup? I don't need another email address. I just want to skip to the chase and get the building instructions for the Lite I.F. board then download the software, which apparently can be anything for SDR." I'll send them to you. "Is the SoftRock product a take off from the FlexRadio folks? Like an affordable version of the $2700 FlexRadio?" "With the proper software loaded can I demodulate the usual modes plus synchronous detector and DRM???" Is the SoftRock product a take off from the FlexRadio folks? Like an affordable version of the $2700 FlexRadio? The Softrock costs $12. It is nothing more than a converter - a quadrature converter - but just a converter. It takes some higher frequency RF and converts it to two (2) lower frequencies in quadrature-phase. These lower freqs can then be fed into your computer sound card. From there, you can use several different software packages to tune, demodulate, etc. The PowerSDR software is one of the software packages you can use. It is the SAME software used on the Flex software. With a SoftRock and the PowerSDR, you can do anything on receive (minus the tuning range limitation of the particular SoftRock you are use) you could do with a Flex Radio. Minus many whistles and bells?? Almost none on receive. See above. Here's the info on the input coil / transformer setup I switched to on the 455 kHz i-f SoftRock. Since I have two units I was able to A-B stock to new looking at 'gain', center frequency and bandwidth. Gain and bandwidth were virtually identical and the center frequency was corrected to 455 kHz - not that this was an issue in the stock setup. Haven't had a chance to look at improved balance with the trifilar wound transformer. This new coil measures 81 uH with a Q of 200. The original coil measured 94 uH (too much inductance causing the center frequency to be low) and a Q of 55. The new 81 uH coil resonates with C21 right at 455 kHz. The new transformer measures 4.7 uH with a Q of 75. The original coil measured 4.6 uH with a Q of 145. The new transformer resonates with C22 right at 455 kHz. Is it worth swapping to these components? The new L1 is a much better fit on the board and is significantly easier to wind. T1 will provide better balance (perhaps improved performance) and is likewise much easier to wind. If anyone is interested, I have a stash of these cores and can drop a set in the mail. Jay, I used the same size core for the transformer but used 3 turns trifilar on type 77. Type 61 should be good up to 6 meters. Sounds like 61 is the winner. 77 gets lossy above 10 mHz but may be better for lowfer applications. I would be interested in changing out the original inductor and matching transformer with the cores you suggested. If you could I would like a couple cores. More than happy to help out. QRZ.com address okay? Mistake I used type 73 cores not 77. They are very similar though. Jay you might send him some trifilar wire what 3 or 4 inches should do it. PS, of course the improved Q etc should help my old SX-28, don'tyaknow. Yes...I'll include some #32 trifilar for T1 - anything larger won't fit and some plain #32 for for L1 - although you can fit larger wire on that core. Ralph...you're on the list. I have ordered two 455khz softrocks. I would like to try your cores on one, if available. I will put one on the HRO, and one on the RME 69. The winding is getting a bit hard for these old eyes. Thanks! Address is ok on QRZ. The inductor is wound and ready to install on the board. I received your package today, also received the SR kits from Tony today! Now I can fire up the new soldering station I picked up at the Marietta hamfest on Saturday. Any ground loop induced hum or noise will compromise the cleanliness of the display - this is particularly noticeable on a clean unmodulated test carrier as used for that test. Any hum or noise will appear as unwanted products close in on each side of the displayed carrier - how far down they are depends on the severity of the problem. It may be far enough down to be inaudible (or nearly so) but still be readily apparent on screen. 100 dB down is a long way! In my situation (with the R-390A on one bench and softrock / computer a distance away on another bench) the hum and noise problems were pretty bad looking when first installed. Several things helped the situation. 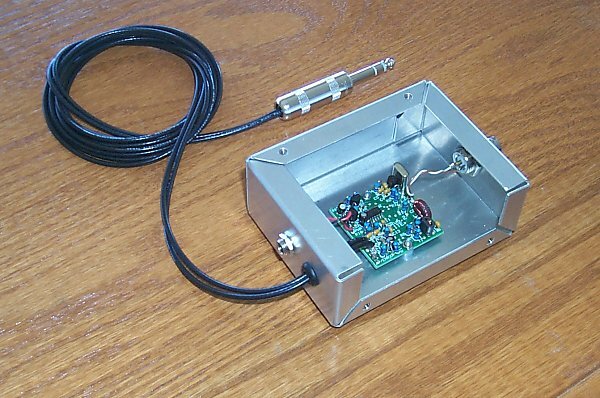 The 455 kHz input to the SoftRock (ANT INPUT/ANT RETURN) connections are floating above ground and keeping the ANT RETURN above ground made a significant improvement. Initially I started with a standard BNC connector on the housing and grounded the ANT RETURN. Switching to an isolated ground BNC made a big improvement. Since there's up to 4 volts p-p at the AUDIO I and Q output it's prudent to feed the sound card with separate shielded cables - not a pair of wires inside a single shield. I used good quality RG-174 coaxial cable. One might be tempted to install a stereo jack on the housing (as I did in the initial setup) but this can be a mistake. Unless the jack is isolated from ground this can be another path for ground loop hum and noise. Running the cables out through a grommet solved that problem. For power I used a standard coaxial power connector attached to the enclosure, however, the power supply is a regulated wall wart that is isolated from ground. The board draws about 18 mA so long term battery powered operation may not be practical. So the only ground connection for the board occurs at the computer sound card input via the AUDIO OUT I and Q cables. This has provided the cleanest display. No problems with rf pickup from other high powered transmitters running in the shack have been noted. As always, your mileage may vary. After using the R-390A/SoftRock/PowerSDR setup for a couple weeks now I can attest that this is one nice setup. The R-390A is an impressively clean front end (albeit a bit weak in the IMD dynamic range department) and the SoftRock/PowerSDR setup is nothing short of impressive. Thanks ever so much for sending me the toroids and wire! !